NEW WEBSITE: PREPARE YOUR PROFILES! The new integrated Cultural Alliance of Fairfield County + FCBuzz.org website is nearing completion. FCBuzz will now be a part of the CAFC website and will be known as FCBuzz Events. The URL, "FCBuzz.org" will redirect visitors to the FCBuzz Events section of our new website. You will be asked in the next few days to upload your profiles to the new website. This is a perfect opportunity to think about the way you present yourself to visitors to our site. Many artists simply have "artist" or "painter" in their description, when they could be sharing their unique vision on the world and their many accomplishments. In preparation for your re-do on FCBuzz Events, have a look at how your peers present themselves on our current site here. Our August Spotlight on Arts & Culture WPKN 89.5FM program featured a conversation on Museums of the Future with Kathy Maher, Executive Director of Bridgeport's Barnum Museum. If you missed it, you can hear it as a podcast here. Hear how P.T. Barnum in the early 19th-century was at the vanguard of imagining what "the museum" would look like (buying up part of the collection of Charles Willson Peale's Philadelphia Museum) and then imagining the role of entertainment in making the objects within the museum come alive. Even before a tornado and two hurricanes ravaged the Barnum Museum, hear how Kathy and her Board were focusing on new and innovative methods, integrating history, arts, science and technology to create a dynamic 21st century Museum for the future. Hear about other museums on the same track and find out about a panel on this subject coming up at the conference of the New England Museums Association in Stamford this November. We are pleased to announce the return of the Progressive Gallery Tour, our monthly visit to member galleries, town by-town from Greenwich to Stratford. The tour begins Sat. Sept 15, when we visit 5 member commercial galleries in Greenwich between 2 and 5pm. Speakers currently include gallery directors and David Dunlop. The full program will be announced shortly. The program is free to all, but reservations are required. Save the Date! Heide Follin and Susan Leggitt were two of the four artists selected at the Carriage Barn Arts Center's 2017 Annual Member Show to participate in a special group exhibit at New Canaan's Sorelle Gallery: The Carriage Barn Collection. The show runs through Aug. 24, with a special closing reception Thurs. Aug. 23, 5-8pm, that coincides with New Canaan Chamber of Commerce's Taste of the Town Stroll! Andrea Bonfils has work included in the magnificent exhibition of 80 master photographs in Photography's Greatest Icons at Isabella Garrucho Fine Art on exhibit through Sept. 10. Heide Follin was one of the four artists selected at the Carriage Barn Arts Center's 2017 Annual Member Show to participate in a special group exhibit at New Canaan's Sorelle Gallery: The Carriage Barn Collection. The show runs through Aug. 24, with a special closing reception Aug. 23, 5-8pm. At right, Prayers in the Wind (two 18x18 pieces) and No Ordinary Place (2017, acrylic on board, 18x36) are among the work selected for the show. Heide comments that these acrylic paintings "bring to life my mystical experience in the unique himalayan country of Bhutan. I wove prayer flags and ethnic textile designs into the landscape of mountains and valleys and buddhist teachings." 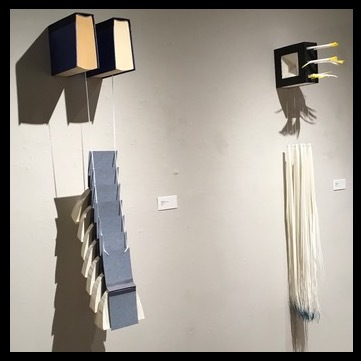 Kate Henderson is one of five new artists at New Haven's Kehler Liddell Gallery (873 Whalley Ave.) in a show, Take 5, running through Aug. 26th. Kate’s current series of pastel collages is titled “Adventures in Life, Feminism, and Beyond.” At right, Sublimation (2018, pastel on paper, 33x25, detail; click for complete image) As with all her work, Kate is interested in the energy of line and gesture and how that transforms our perception of reality. Joanie Landau has one of her digital photographs in the Loft Artists Association 40th Anniversary exhibition, Stamford and the LAA, at the UCONN Stamford Art Gallery. 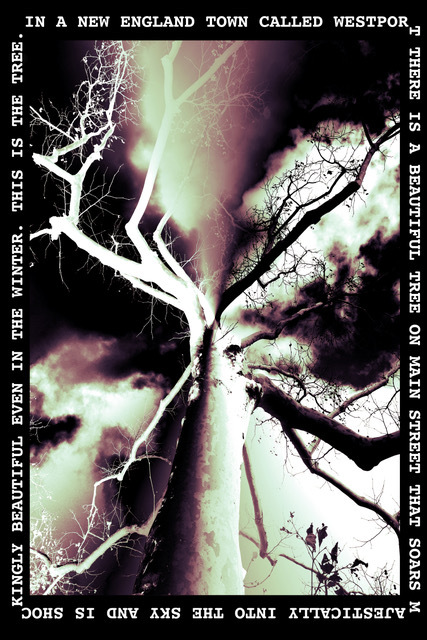 Tree on Main Solo (2018, digital photograph; detail at right click for complete image) highlights a beautiful tree that Joanie found in Westport. The LAA exhibit runs through October 4th. Susan Leggitt was also one of the four artists selected at the Carriage Barn Arts Center's 2017 Annual Member Show to participate in a special group exhibit at New Canaan's Sorelle Gallery: The Carriage Barn Collection. The show runs through Aug. 24, with a special closing reception Aug. 23, 5-8pm. At right, Quietly Flowing (2017, oil on canvas, mounted on cradle board, 11x14, click for complete image). 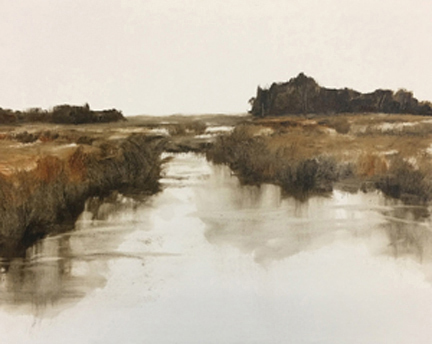 Susan comments that the paintings in the Sorelle show are from her minimal landscape series: "I am distilling the landscape to its most pertinent elements, using only 2 or three colors, thus giving each painting a Zen-like quality." Chris Perry has two pieces in The Book As Art v.6.0 Pulp at the Decatur Arts Alliance, Decatur, Georgia, through Sept. 28. Click the link to the show above for an online catalog. At right an image of Chris' two pieces: 163 Ripples: ladder (fish) and 172 Ripples: meltwater (click titles for larger images of each work). Jay Petrow was recently accepted into the Virginia Center for the Creative Arts (VCCA) Residency, one of the leading artists communities in the world, with national and international writers, visual artists and composers in residence. 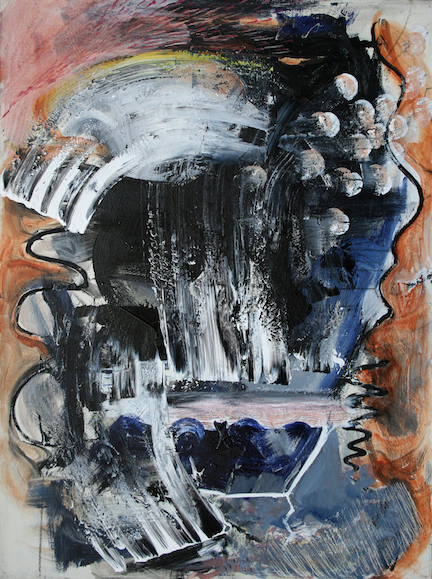 One of the paintings used in his residency application was Circus (2018, acrylic on canvas, 30x36; detail at right, click for larger image). Jay says he plans on using his time at the residency to paint larger canvases exploring his experiences fathering an autistic child. Barbara Ringer has a piece in Metamorphosis, Imagery of Transformation, an all medium art exhibit at Art & Frame, Danbury, opening with a reception, Sat. Aug. 18, 5-7pm (with live music, hor d'oeuvres, wine and beer) and running through Sept. 22. At right, detail of Barbara's Change Hurts (2018, photo-based mixed media - canvas, thread, cotton batting, steel mesh, and wood - 24x18x3; click for larger, complete image). Mariya Rivera has a painting in the Katonah Museum Artists’ Association juried exhibition, It’s About Color, at Pound Ridge Library, August 28 – September 28. A reception will be held Sat., Sept. 8, 1 - 3pm. Mariya's painting is Remembering (2011, oil on canvas, 24x24). 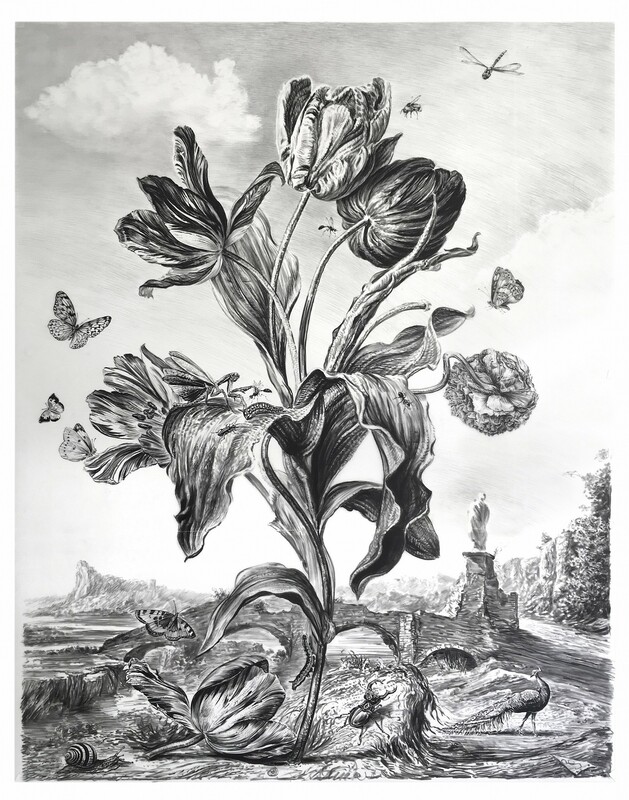 Rick Shaefer is showing a new series of seven botanical charcoal drawings, The Parson's Tale, inspired by the last of the twenty-four Canterbury Tales, at Sears Peyton Gallery (210 Eleventh Avenue, #802, New York) opening with a reception, Thurs. Sept. 6, 6-8 pm. At right, a detail of Untitled #1 (The Parson's Tale) (2018, charcoal on vellum mounted on aluminum, 61x48; click for full image). In the narrative of seven floral landscapes, Rick has given added emphasis to the small panoramas at the base and background of each piece - clues to the specific theme of each drawing. Vin Verrillo is putting together a book of his photographs and paintings: A Separate Voice. At right, Untitled (detail), one in a series of photographic works Vin is experimenting with, using Lightroom. He says he was working on the original of the image, one in a series on water, in Lightroom, and noticed a section of the image conveyed exactly what he was looking for. He photographed that section and ran it through Lightroom again. Sat. Aug. 18: Metamorphosis, Imagery of Transformation, Art & Frame, 60 Newtown Rd., Newtown. Opening Reception, 5-7pm (Barbara Ringer). Thurs. Sept. 6: Rick Shaefer, The Parson's Tale, Sears Peyton Gallery (210 Eleventh Ave., NYC). Opening Reception, 6-8pm. The Brooklyn nonprofit arts organization BRIC has appointed Kristina Newman-Scott as its new president (see New York Times article). BRIC is perhaps best known for its flagship summer concert series, the BRIC Celebrate Brooklyn! Festival. Kristina served as Director of Culture for the State of Connecticut since May 2015. Her last day of state service was August 2. Prior to this role, Newman-Scott served as the Director of Marketing, Events, and Cultural Affairs for the City of Hartford; the Director of Programs at the Boston Center for the Arts; and Director of Visual Arts at Hartford's Real Art Ways. "Kristina has done a terrific job bringing innovation and inclusion to our cultural programs and she will be sorely missed at DECD and across the state," said Catherine Smith, Commissioner of the Department of Economic and Community Development. "I have depended on her strong arts experience, creative approach to problems and ever-thoughtful decision making abilities. Though thrilled for her and the opportunity that BRIC presents to Kristina at this stage of her career, we will feel the gap in the loss of her leadership at DECD. We wish her the best in her future role." Kristina wrote in a final statement in her position: "I’m so grateful to have had the opportunity to serve the State of Connecticut as Director of Culture. It has been tremendous to work alongside a strong leader in Commissioner Catherine Smith, who empowered our team to be bold and innovative. I will miss my staff but know that they will continue to thrive. Connecticut has strong and vital arts and historic preservation communities, and I am encouraged by its willingness to double down on relevance, equity, access, diversity and inclusion (R.E.A.D.I) as a model to empower the citizens of our state." The Stamford Art Association (SAA) invites artists to submit work for the next exhibit at Stamford's Ferguson Library (at the corner of Broad and Bedford Streets). This show is open to all SAA members and non-members and is a juried show. All two dimensional media are welcome. Cash prizes will be awarded. The theme of the show is “Fall Fantasy”. The opening reception will be Sept 12, 6 to 8pm. at the Ferguson Gallery. Please submit up to 3 jpeg images to: SaaShowEntries@aol.com no later than Monday, August 20. Jpegs should be clearly marked: jpeg #, last name, first name, title, size (WxH), medium, price. Include contact information: name, email, phone, address, in email. Entries not properly labeled with all information will not be considered. Accepted artists only will be notified by email by Sept. 1. 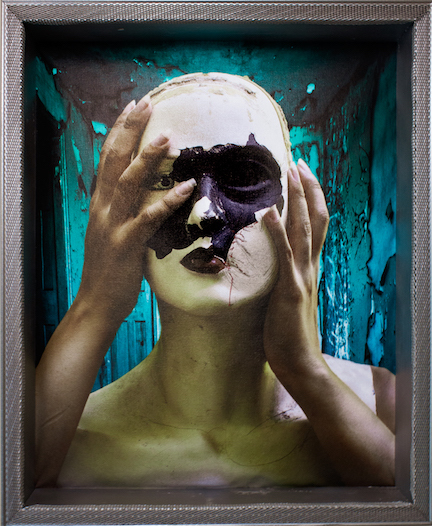 Work must be framed under Plexiglas and wired for hanging, not larger than 48x60” framed. Work framed under glass or not wired will not be accepted. Further information on exhibit requirements is posted here. Receiving will be Thurs. Sept. 6, 5-7pm & Sat. Sept. 8, 10am to noon. Receiving is on the third floor of the Ferguson Library. Signs will be posted for the receiving area. There is a $35.00 fee. All artwork must be for sale. A commission of 25% on work sold will support SAA. See full prospectus here. The Rowayton Arts Center announces its Photography and Sculpture 2018 Exhibition for its Exhibiting Members. Exhibit dates are Sept. 2-22. The opening reception will be Sun. Sept. 9, 4-6pm. This is a juried show and the judge is photographer Joan Fitzsimmons, Professor of Studio Art at Norwalk Community College. Exhibiting Members may submit unto two works (one photograph and one sculpture or one of each). Exhibiting fees are: $20/1; $35/2. Receiving Dates: Mon. Aug. 27, 4pm-7pm, and Tues. Aug. 28, 11am-2pm. Pick up: Mon. Sept. 24, 4pm – 7pm, and Tues. Sept. 25, 11am – 2pm. Artists may become full exhibiting members in one of two ways: a) Multiple Juried Exhibition Acceptances: An artist who has been juried into any three Open Juried Exhibitions held at the Arts Center (in February, June and October) during a two-year period, is invited to become an exhibiting artist member; b) Artist Selection Committee: in January, May and September artists may apply by submitting work (next drop-off date is Thurs. Sept. 6, 12-5 pm. There is no submission fee; if selected, annual dues are $55. 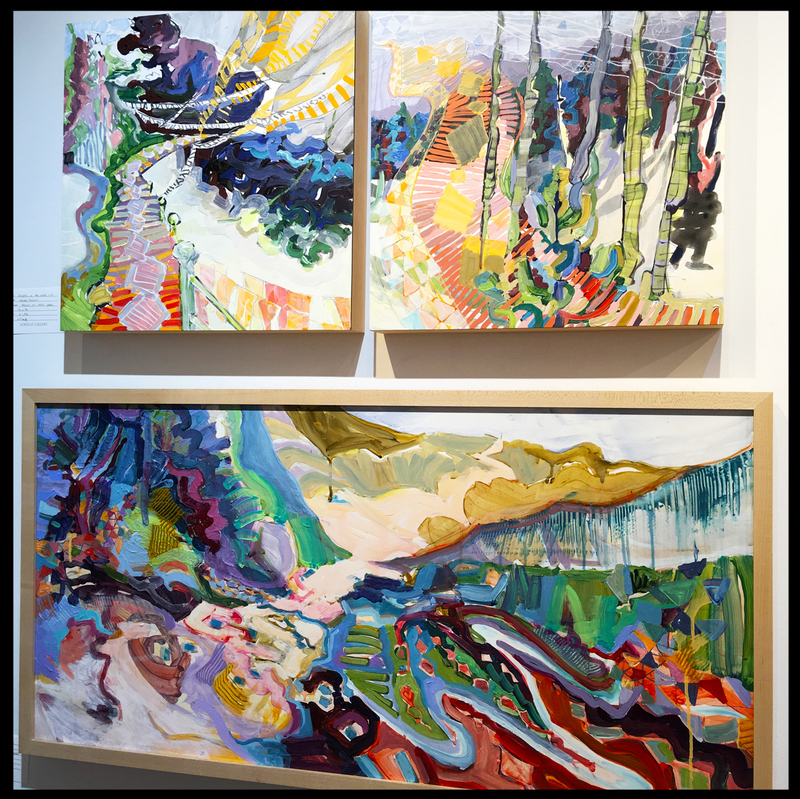 Submit three gallery-ready works (in painting, printmaking, drawing, photography, mixed media, watercolor, or textiles. Sculptors submit one work plus photographs of other sculptures. A Brief Biography and/or Artist Statement must accompany the work. For more information, click here. The Greenwich/Westchester Art Fair will present a curated selection of up to 50 art galleries in the Greenwich and West-chester area. Some 50 artists will be selected to display their original works at this four-day cultural event attended by leading primary dealers, collectors, interior designers, and corporate art curators. The venue for the ArtFair is the Performance Art Center of Purchase College, located in the center of Westchester County - 5 miles from Greenwich, and 30 miles from New York City. Artists selected by the panel of renowned jurists will have their work displayed for sale at the ArtFair. In addition, they will receive a complimentary invite to the VIP event commemorating their works at the Performing Arts Center of Purchase College on the evening of October 13. The Competition is a unique opportunity for both new and established artists to raise the profile of their artwork on an international platform. With a seasoned panel of jurors and a motivated demographic of art aficiondos, the 2018 Greenwich-Westchester International ArtFair Competition is the one event this year that both established and emerging artists should not miss. Media: drawing, painting, photography, digital art and mixed media (sculptures and 3-D work must be accompanied by a pedestal). Fees: $75.00 (up to 3 images); $85.00 (4); $95.00 (5). Fee for 3 & 4 images includes a complimentary ticket to the ArtFair ($70.00 value), five images includes two tickets (value of $125.00). Venue parking of $15.00 not included. Jurors: Bruce Laurie and Karen Lamonica Click for Prospectus here. The non-profit Spectrum Art Gallery (61 Main St., Centerbrook, CT) and Arts Center Killingworth is calling for artists working in all mediums to submit art for the first INDOOR/OUTDOOR Autumn Arts Festival, located in Madison, CT. The two-day event takes place Sat.-Sun. Oct. 6-7, 2018 and is limited to 40 participants (30 indoor and 10 outdoor artists). Festival artists have the additional option to exhibit work at Spectrum Gallery during the concurrent Group Gallery Show, September 21-November 4, 2018 and may add work to the Spectrum online shop for added exposure. Only artists participating in the Festival may apply for the exhibition. Representational and abstract painters, sculptors, illustrators, photographers, printmakers, fabric artists, glass and wood artisans, jewelry designers and crafters are encouraged to apply. Visual artists working in oil, acrylic, watercolor, photography, pencil and charcoal, paper, mixed media, fabric, glass, wood, stone and clay, are all welcome. The Festival will be held at the American Legion Hall in Madison. There are 30 artist spots inside the Hall and 10 on the surrounding grounds to exhibit and sell artwork. The Arts Center provides a group tent and one 6-foot table per artist. $80, nonrefundable Participation Fee. Submit 3 digital images of artwork (300dpi, 1-2 MBs) to barbara@spectrumartgallery.org. Include: title, materials used and size with each jpeg. Include: "Submissions for Autumn Arts Festival" in subject line. Also include 300-word (max) bio, describing artistic style, awards, education, participation in art shows, and other noteworthy information. Full prospectus here. In Plain Sight/Site is an exhibition at Artspace New Haven, opening Nov. 2018 that aims to lay bare and intervene in the histories and formulations of labor, race and commerce that have arisen through centuries of uneven exchange via trans-atlantic slave trading routes that connected Western Europe, West Africa and the South American, Caribbean, and American colonies. Although centuries have passed, the impact of this system lingers like a ghostly presence beleaguering populations far and wide. This exhibition seeks to excavate the stories of these routes, by highlighting the integral roles of the enslaved populations and what their movements and labor produced. Artists are invited to submit works that incorporate the body, sugar, coffee, cotton, indigo, and/ or wood, as mediums or central concepts. They should explore an aspect of the New World slave trade, addressing what was at stake, what was lost, the geographic routes, and/or what was born of the era’s forced migrations—including changes in culture, industry, government, and landscape. Artists may submit work in any medium, including performance, and may address Southeast New England’s role in the triangular trade, and/or the region’s shaping of "American-ness" as we know it. Apply here. CraftBoston is a biannual show and sale of fine contemporary craft and design. Both CraftBoston Spring and CraftBoston Holiday unite talented makers with passionate and knowledgeable shoppers throughout weekend-long events. The shows are produced by the Society of Arts + Crafts, America’s oldest non-profit craft organization, whose mission is to support excellence in crafts by encouraging the creation, collection, and conservation of the work of craft artists, and by educating and promoting public appreciation of fine craftsmanship. There is only one application, deadline, and fee ($40) to apply to both CraftBoston Spring 2019 and CraftBoston Holiday 2018. 175 exhibitors are included in CraftBoston Holiday, presented at the Hynes Convention Center in Boston’s Back Bay neighborhood. Special program-ming, including themed booths, a lecture series, mentor program, awards, and craft tours, create a sophisticated atmosphere for shoppers to learn about contemporary craft. Show dates: Dec. 14-16, 2018; Move-in dates: Dec. 12-13; Opening night party: Dec. 13. 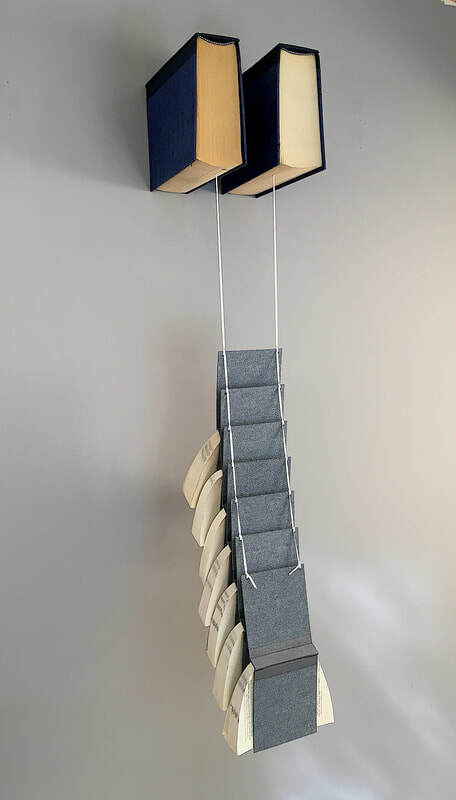 CraftBoston welcomes applications from both established and emerging artists making original work that shows exemplary execution of design, quality craftsmanship, creative use of materials, and superb aesthetic qualities. Artists that are new to CraftBoston will receive recognition in the show program guide and signage on the show floor. Accepted media categories include: baskets, ceramics, decorative fiber, wearable fiber, furniture, glass, jewelry, leather, metal, mixed media, paper, and wood. To apply: Submit five digital images to the jury via juriedartservices.com by midnight Sept. 10. Submit high-quality professional photo-graphs; and include the $40 application fee for one or both shows. CraftBoston 2018 jurors are: Brian Ferrell, Associate Professor of Art at Seton Hill University in Greensburg, PA; Brigitte Martin, creator and editor of crafthaus, an online social network for professional craft artists worldwide; and Janet Koplos, longtime Art in America writer/editor. Prospectus here. The Outside In Gallery in Piermont NY and curator, Lisa D'Amico PhD, announce the Inside Small: Small Works Juried Art Exhibit, to be held Nov. 13, 2018 - Dec. 16, 2018, with an artists' reception on Nov. 24th, 2pm-5pm. This exhibition is open to all artists in New York, Connecticut and New Jersey. Artists outside of the area will be considered upon request. Artists may submit a maximum of three (3) entries for consideration. Inside Small challenges artists to create works no larger than 12″ in any direction with no limitation on imagination. Painting, drawing, photography, collage, printmaking, metal, glass, fiber, ceramics and sculpture are all welcome. Artwork must not exceed 12" inches x 12” inches (or 144” sq. inches), including frame or base. Artwork weight limited to 25 lbs. Artwork must have been completed within the past two years. If applicable, artwork MUST be ready to hang. All work must remain on display for the duration of the exhibit.There is no entry fee; however, artists whose works are selected will pay an installation flat fee of $25. Curated by Lisa D'Amico, the jurors for the show are artists: Grace Knowlton, Marlene Krumm-Sanders, and Eleanor Grace Miller. Artists may submit unto three entries for consideration by October 14, 2018. Mail photos/disks or email high resolution jpgs (max 3mb file) to insidesmall@outlook.com or to Lisa D’Amico (Curator), PO Box 9204, Bardonia NY 10954. Selected artists will be notified via e-mail by October 21, 2018. Email any questions to insidesmall@outlook.com. Complete prospectus available here. The Sustainable Arts Foundation is a non-profit foundation supporting artists and writers with families. Its mission is to provide financial awards to parents pursuing creative work. In 2018, the Foundation will make awards of $5,000 each to twenty artists and writers. Additionally, it will name ten award finalists. The awards offer unrestricted cash, and recipients can use the funds as they see fit. This is an award program that rewards excellence in a creative field and the selection process is focused almost entirely on the strength of the submitted portfolio. Artists and writers with at least one child under the age of 18, and a strong portfolio of polished work, are welcome to apply. Given the intense demand for these awards (typically 3,000 applications), and the fact that the awards are based on demonstrated excellence in your discipline, emerging artists are not encouraged to apply. See list of previous awardees and follow the links to their work to get a feel for their level of craft. Generally, half the awards are made to applicants of color (read about this decision here). Writers may apply in the following categories: Creative Nonfiction; Early and Middle Grade Fiction; Fiction; Graphic Novels; Long Form Journalism; Picture Books; Playwriting; Poetry; Young Adult Fiction. Visual artists may apply in: Book Arts; Drawing; Fiber Arts and Textiles; Illustration; Installation; Mixed Media; Painting; Photography; Printmaking; and Sculpture. At this time applicants are not accepted in the performing arts, film/video /tv (including screenplays), music, jewelry, pottery, and other crafts. The application fee is $20 and the application has three parts: personal information; artistic information and the portfolio. The portfolio is the primary factor considered in evaluating each application. It should only include work created since becoming a parent and within the last 3 years. For detailed information and to apply, click here. Through the New England Dance Fund, the New England Foundation for the Arts (NEFA) will award small, catalytic grants of $500 to $1,000 directly to choreo-graphers who identify and articulate a critical opportunity that will significantly advance their career in dance. The Fund gives priority to timely opportunities with the goal of supporting a diverse group of artists from a range of cultures, disciplines, aesthetics, and career stages throughout all six New England states. Depending on the amount of funds available at a given deadline, applications for activities that would be eligible for a later deadline may be rolled over for consideration at the next deadline. Eligible choreographers are those that: have a Creative Ground profile with DANCE as the primary discipline; reside full-time and make work in one of the six New England states; be applying for an opportunity that will take place between Nov. 1, 2018 and Oct. 31, 2019. Eligible opportunities include: residencies; research trips; conferences; workshops or other trainings that build creative or administrative skills; tour planning; publication expenses; documentation; video shoots; artist fees needed to prepare the work for a pivotal presentation opportunity; hiring a consultant; mentorship. New England Dance Fund grants may be paid directly to individuals, 501c3 organizations, or to fiscal sponsors. The Fund does not support ongoing operations or activity, nor school, youth, or student companies and groups. Register and start your application here. artnet has a recent review of six sites that can help you sell your art online. It reviews, roughly in order of quality) Saatchi Art, ArtFinder, Vango, Gallery, Absolut Art and the Tappan Collective for what they do and don't do for you. Here are some of the headlines: Saatchi Art is one of the biggest sites with around 500,000 original artworks by more than 60,000 artists, priced between $125 and $100,000. Application is free and easy to complete, with helpful links to uploading images and creating a profile. You might get a boost by gaining a “seal of approval” from one of the site’s curators. Artists receive 65% of sale proceeds and payment comes 1-2 weeks after the work is delivered to the buyer. Overall, the user experience is very good. ARTFINDER boasts AI technology to match buyers with art they like, has 300,000 works by 10,000+ artists and 500,000 subscribers, priced from $13 to $11 million! Artists receive 67%. Generally the user experience is good. VANGO includes an e-gallery, studio manager software, and even a podcast. Prices range from $100 to $5,000. Artists receive 70%. The website proved difficult to navigate, so overall for buyers the experience is not so great. However, for artists the Vango Studio works as an “inventory management tool” to help compile, organize, and track the platforms you use to sell and the transactions you complete—making it a one-stop shop for operating your accounts at Artfinder, Saatchi, and other partner sites. Also, the Studio offers to help artists write their bios, shoot videos, and photograph their work. UGALLERY only accepts original works and has 7,000 artworks by 500 artists with prices ranging from $75 to $17,000. Artists get 50% paid 30-40 days after delivery. Overall "pretty good;" not as sleek a website, but with a responsive chat function and helpful marketing tips for artists. ABSOLUT ART collaborates with artists to produce limited-edition artworks, signed, framed, and delivered to the collector’s door. It contains 400 works by some 150 artists, priced from $105 to $3,065. The site promotes itself more as a tool for collectors to find new art to buy, not as a way for artists to promote themselves. Artists take 50%. Selection process for artists is exacting. TAPPAN COLLECTIVE was created to “foster the careers of emerging artists by giving them an online platform to sell their work, tell their story, and reach collectors all over the world.” It contains 1,300 artworks available by 56 artists with prices ranging from $15 zines to $12,000 unique sculptures. How you get in is unclear and the cut is undisclosed. Long Wharf Theatre (LWT), a regional nonprofit theatre with a mission to create high-quality theatre that engages and inspires our community – is seeking a Front of House Manager to oversee the daily front of house operations for all performances and events including concessions; ensure the safety of patrons, volunteers, and staff through the proper implementation and enforcement of emergency procedures; oversee volunteer usher program; manage assigned events; and work with other key staff to support LWT’s mission, vision, and values. Essential Job Duties include: Front of House: serve as a welcoming face of the theatre for patrons; supervise and schedule bartenders, head ushers, and volunteer ushers; ensure patrons are safely and efficiently seated and ready for performance in a timely manner; enforce safety and fire; prepare and distribute detailed house reports with pertinent information after every performance; manage volunteer ushers, provide orientation and training, in positions for patrons seating, ticket taking/program dispensin; develop volunteer recognition and evaluation programs; maintain FOH staff and volunteer handbooks, and more. Concessions and Merchandise: manage budget and track concessions income; inventory and order concessions items as needed; oversee income and expense budget; seek ways to increase revenue from the merchandise and concessions sales, etc. Competencies: ability to work with Long Wharf employees in a collegial manner; ability to work alone or on a team, as needs require; strong written and verbal communications skills in English; self-motivated; ability to perform many tasks in one day, etc. To apply: email cover letter and resume to humanresources@longwharf.org with "Front of House Manager" as subject. For complete job description, click here. Interest in theatre a plus! Education: Bachelor's of Art is an Equal Opportunity Employer.